You know what? 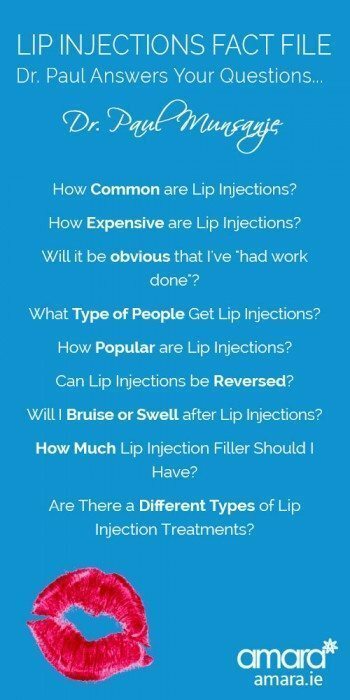 There are so many questions and so much to say about lip fillers and injections that I have had to split this lip filler fact file into 3 parts! You can check out part one here about how long lip fillers last, find out do lip injections hurt and in this post I will answer your most common questions about lip fillers and lip injections like how common are lip fillers, how expensive are they and what type of people get lip injections! How Common are Lip Injections? Well thankfully to walk down the street we no longer see people who look like they have had their lips done as much as we used to. This is because doctors have become more skilled and techniques more advanced. However to know how many people have had their lips done is very tough. In my clinic I perform between 20 and 30 Lip treatments per week. That’s 1500 treatments per year just from little me and there are 350 doctors in British College of Medicine alone. So if each of those does as many as me, that means we do half a million treatments a year. There are many many more doctors who are not registered in BCAM and then there are nurses who also perform lip fillers, so lip injections are more common than you think! How Expensive are Lip Injections? At Amara Aesthetics we charge €450 or £350 for 1ml. We do packages for 2 or more mls. Usually I do just 1-2 mls because although it is possible to increase the size of lips, the more you increase the size from your natural size the harder it is to keep it natural and deniable. Will it be obvious that I’ve “had work done” if I have Lip Injections? Absolutely not. We are not the type of clinic that will do ‘whatever you want’ in fact, several times we have lost customers who wanted more than what we thought would look good. However I have no doubt you will find clinics that sadly will inject as much as you think you need! Your lips will be our business card, so we make sure you look good as we plan to be around for another 10 years! What Type of People Get Lip Injections? How Popular are Lip Injections? 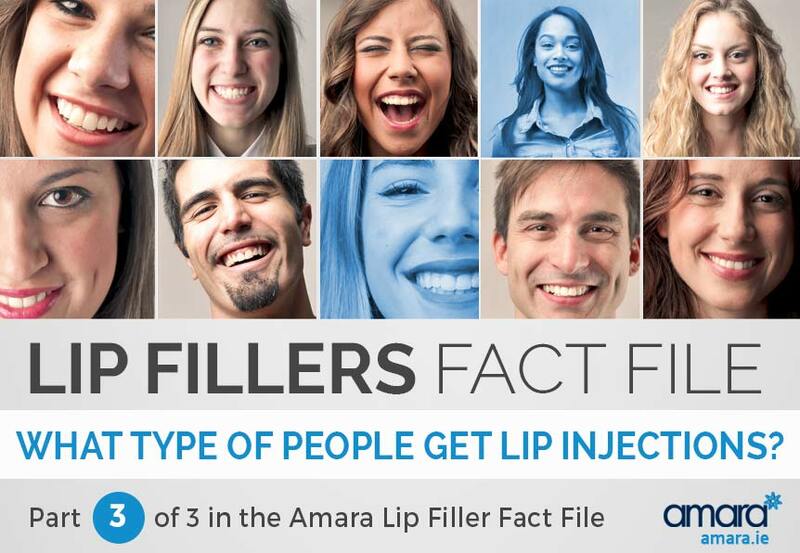 Lip Fillers and botox injections are the two most popular treatments we perform at Amara Aesthetics with botox having a slight edge over lip fillers. Can Lip Injections be Reversed? Using a product called Hyalase you can dissolve lip fillers. I have never done this as I have never needed to, however just the idea provides people with some reassurance that they will not look overdone. Will I Bruise or Swell after Lip Injections? 1 in 20 people will get a bruise from lip fillers. If this happens it can usually be covered with dark lipstick. How Much Lip Injection Filler Should I Have? It’s difficult to know how much lip filler is needed to get the result you want. There is a picture that I have found very helpful. I found it online but I believe I don’t think it is the same person from left to right but it does illustrate something very helpful. The difference between each picture is roughly what 1ml will do. It helps people realise how natural it should look after 1ml. Most people want to increase by at least one step so letting them know this about filler puts their mind at ease. When getting lip fillers the look should always be natural, so jumping from the first to the last picture is not an option. Are There a Different Types of Lip Injection Treatments? So lip injections can be done into the body of the lip (the juicy part) or into the border of the lip where we tend to add lip liner. Lip filler can only be put into part of each of these, so for example, if the body is thinner on one side the filler could be injected more on this side. Because of all these options of where to inject, an assessment is essential to getting a good result with lip filler. This 3 part series has been put together to hopefully answer any questions you might have about lip fillers and lip injections but if you have a question that we didn’t cover please e-mail it to us and we’ll answer it for you! And, if you’d like to book in for a treatment then get in touch.